Manor to Manor Ride: Though locked behind the Iron Curtain for most of this century, Estonia has hung tenaciously to its rich cultural heritage. This is the moment to visit a fascinating country which is just opening up again to the outside world. As a result of invasions from many countries over the centuries, one sees Russian Orthodox onion domes, German manors and Danish castles in the attractive Baltic countryside. 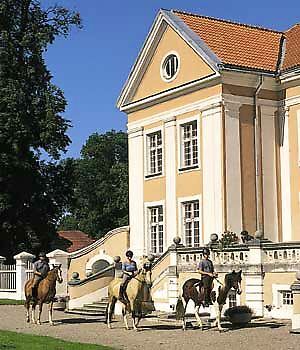 The guide sets an active pace, with long trots and canters along paths ideally suited to riding. The route winds through the fragrant forests of a large national park, visits fishing villages along the coast, encounters 18th century manor estates and provides a glimpse into the unique culture of the Estonian people.